FIJI TIMES is a non-profit exhibition project in a private Auckland studio space featuring experimental artwork reflecting on Fiji’s current political situation or the times of Fiji. The visual reference to Fiji Times Ltd’s historic masthead is an acknowledgment of the newspaper’s role in communicating and reflecting Fiji society and politics. The use of the words ‘Fiji Times’ references the ability for visual arts to communicate and reflect society in a similar way to the media. The title aimed to encourage artists to reflect on their role as cultural interpreters and use their work as a platform for commentary, using visual language. The font we have employed on the e-flier was selected to be similar to the historic Fiji Times masthead but not identical. The FIJI TIMES exhibition has no relationship with Fiji Times Ltd.
Five contemporary artists from Fiji have come together for an exhibition in response to Fiji Day, 10 October. 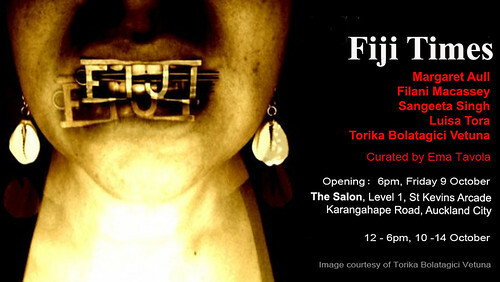 Well aware of the turbulent events happening at home, the exhibition Fiji Times is a personal response to current issues. The Fiji Times exhibition, which features Margaret Aull, Filani Macassey, Sangeeta Singh, Luisa Tora and Torika Bolatagici Vetuna runs from 10 to 14 October at The Salon on Karangahape Road in Auckland. Inspired to make commentary on the current situation in Fiji, the artists have developed experimental works in canvas, paper, tapa and cloth that tackle issues of leadership, faith and religion, censorship and militarism, propaganda, love, land and diaspora. Ema Tavola has curated the show and admits the work is politically inspired. “The artists are able to take advantage of being on the outside, commentating from afar,” she says. Women artists from Fiji have been asserting their presence in contemporary Pacific art circles, particularly since the Vasu: Pacific Women of Power exhibition, held in Suva in September 2008. Based between Melbourne, Waikato and the Auckland region, the five women artists have recently started to work more closely together. “It’s exciting to have a strong network of Fiji women artists living relatively close by, particularly Luisa and Sangeeta, who have recently relocated to South Auckland from Suva,” says Ema. The exhibition opening will feature a live performance from Fijian musician, Stevie J. Artists will be present at the exhibition opening and will be at the gallery for the duration of the show. Works are for sale. In the beginning, th… on Sold!!! Toni Fortune on Exhibition angers reader!